Posted March 31st, 2017 by aps2016 & filed under News. Batteries need to be sized correctly to be able to feed the required load for the required time, and a number of factors need to be decided to be able to optimize the battery for the duty expected. Some of these factors are fixed within the chemistry of each type of cell and, in some cases, the physical structure of the plates that make up the cell. The cells that make up any battery have a limited voltage range specific to the type of cell being used. In the case of lead acid batteries, the cell nominal voltage, which is the voltage of a fully charged cell without any input charge or load, is 2 V.
On the other hand, the minimum voltage that a battery cell can safely supply a load without damage is typically 1.7 V, although to give a margin of safety, it is more normal to use 1.75 as the operating minimum. Similarly, to be able to charge a battery, the voltage across each cell must be more than the nominal 2 V, and to keep a battery fully charged, each cell typically needs to be kept energized at 2.2 to 2.25 V, dependent on cell construction. This is the float-charge voltage. Because individual cells in a battery can develop higher impedance than others when floated for a significant time, or after they are discharged, batteries only charged on “float” can result in some cells being less charged than others. To overcome this condition, it is necessary to subject the battery to a higher voltage, the equalize charge voltage, which could be up to 2.7 V per cell. Although the higher voltage would allow a faster recharge and would even up the charge on individual cells more quickly, this level of cell voltage would make the battery voltage range exceed the rating of most equipment that uses DC supplies. It is therefore usual practice to keep the equalize charge in the range of 2.33 to 2.5 V per cell and extend the time required to equalize the battery. Because the equipment fed by such a battery must also be operable with a level of voltage drop in the associated distribution cables, the operating range should cover the range 100–140 V. For international use, the typical lead acid battery consists of 55 cells having a battery voltage range of 96–128 V, resulting in a required equipment voltage range of 91–128 V.
Posted January 28th, 2017 by aps2016 & filed under Recent Projects. APS was subcontracted by Sturgeon Electric to install multiple 480VDC flooded battery strings on Buckley Air Force Base (BAFB), in Aurora, CO. Overall, this was a $141M project requiring the construction of approximately 200,000 Square Foot Operations Controlled Access Facility. This was a high profile project ran by the United States Army Corps of Engineers (USACE) that involved top secret security and anti-terrorism measures. The Mountain View Facility will serve as a data center that will house both aero and cyber space industries. Flooded Battery Rack Construction – Many battery racks were constructed. This included the torque sealing of thousands of bolt assemblies. All rack anchoring followed International Seismic Application Technology (ISAT) seismic requirements. Flooded Battery Installation – Multiple strings were installed. This included 125VDC flooded strings in substations and chiller plant along with 480VDC battery strings in UPS battery rooms. Work included the strapping of all batteries in series connections. Strings were kept at less than 100VDC for safety purposes until final connections were called for. Disconnect and Wiring – APS landed all battery conductors running from each battery disconnect onto +/- battery posts. Wiring also including a center break tap with up to (6) 444DLO conductors used per polarity. 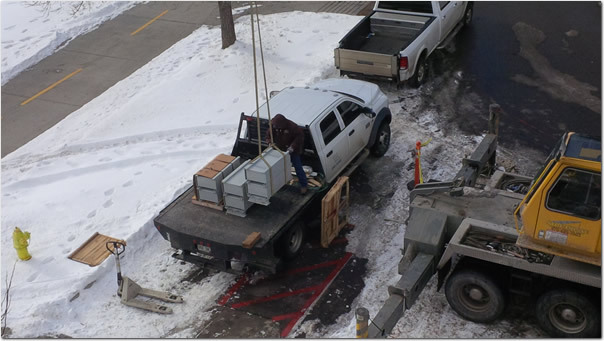 Safety Practices – All tools were calibrated on a yearly basis, as was the 1-ton battery hoist and frame. Technicians making final connections were outfitted in 25CAL, arc-flash resistant, suits. Employees were trained in numerous aspects regarding project specific courses that included: certified rigger, forklift and pallet jack, arc-flash, and site safety orientation. Additionally, all workers passed a drug and background check. 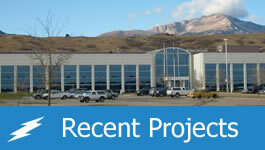 Project Documentation – APS personnel were responsible for keeping up-to-date progress reports with the customer. This included providing all product specification sheets MSDS’s, and daily contractor reports. Posted January 28th, 2017 by aps2016 & filed under Uncategorized. APS was involved with this fast track, large (over 50,000 sq. ft), data room buildout from the ground up. A unistrut grid was built underneath the raised floor in order to support the massive amount of equipment (relay rack, batteries, cable, ladder rack, and aux bar) that was installed above. Each rack was supported with (4) 5/8″ all threads per rack. From a power equipment standpoint, we installed (1) FBO 4848 DC power plant with (1) Supplemental Bay, (6) 200A rectifiers, and a building ground bus. Included was connection of (2) strings of 48VDC batteries along with IEEE disconnects, (1) temperature probe per battery string, battery disconnect alarming, and the 750MCM cabling from batteries to the power plant, along with commissioning. APS installed (71) FBO 2 post racks, (26) FBO 4 post racks, FBO fiber bay, (6) FBO BDCBB’s, (36) FBO 60A FAP’s, and (28) FBO 200A FAP’s. We installed low/high aux bar, low/high ladder rack, ground hangars, and 4″ fiber tray with 4″ drops to each bay. We installed customer furnished racks, spacers, and grounding of each rack with #6 wire to a #2 aisle ground. We installed customer provided BDCBB’s and (2) 600A loads to each BDCBB (single 500MCM wire per load). Project also included running loads from the BDCBB’s to the customer provided FAP’s using wire and lugs provided by customer. All wires were labeled. APS competitively bids supply and replacement of battery strings at FAA’s General National Air Space (GNAS) facilities located in the Continental United States, Alaska, Hawaii, Puerto Rico, and Guam against two other contractors: Maetec Power – Fairport, NY; and First Logistex – Peyton, CO. There are approximately 2,200 GNAS facilities, with 13 or more batteries per string, using a variety of battery types, with differing physical characteristics, providing backup power to General National Airspace System (GNAS) electronic equipment. The projected life expectancy of these batteries is 4-years; necessitating a continuous replacement effort, using reliable battery supply sources. The terms of this contract are twofold. One, is to procure/deliver batteries, and battery monitor systems for the FAA-preferred installation contractor Chickasaw Nation Industries (CNIAV). This work also includes the outsourcing of technicians from both Alber and Eaton Corporations to calibrate and commission both the battery and UPS systems. The second part of this contract involves installation services for batteries and battery monitor systems. APS is providing resources to provide six different battery types; shipping services for those batteries; battery recycle/disposal services, and installation services. The battery systems (24VDC, 36VDC, 48VDC, 384VDC, and 480VDC) involve installation of several manufacturers including: C&D Technologies (VLA); Deke/East Penn (VRLA); GNB (VRLA); and Northstar (VRLA). The battery monitor systems include the installation, commissioning and training of FAA technicians on the Alber BDS-40. Prior to arrival Ft. Peck personnel put the battery strings on a 72-hour equalize charge and then floated the batteries for 72-hours. APS was also tasked with providing a 125VDC temporary battery string during capacity testing. Testing equipment included using an Alber Cell Corder, digital hydrometer, and our Alber BCT 2000 for the load tests. A battery assessment report and associated documentation were then sent to Fort Peck personnel 10 days after testing was complete. Posted February 10th, 2015 by admin & filed under APS Project List. This project involved APS removing one string of 24VDC VRLA batteries and installing (2) new 24VDC VRLA batteries onto a two-story recreation center located on the campus at Colorado State University. Due to piping on the roof and existing 10-ton air handlers, this was a logistical challenge, to say the least. Additionally, this project was completed in January, so snow and ice created a safety hazard. 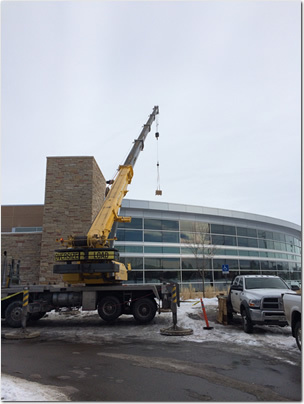 APS subcontracted a 23-ton crane with 100’ boom and performed the job over two days. Posted November 10th, 2014 by admin & filed under News. Description: Maintenance, test schedules, and testing procedures that can be used to optimize the life and performance of permanently installed, vented lead-acid storage batteries used for standby service are provided. 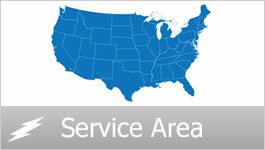 This recommended practice also provides guidance to determine when batteries should be replaced. This recommended practice is applicable to standby service stationary applications where a charger maintains the battery fully charged and supplies the dc loads. When employees use smart lifting practices and work in their “power zone,” they are less likely to suffer from back sprains, muscle pulls, wrist injuries, elbow injuries, spinal injuries, and other injuries caused by lifting heavy objects. A battery backup can help protect your organization’s network, computer systems, and data from loss and destruction–but only if you choose one that’s reliable and designed to meet your needs. Here are the factors and features you should know about when you go shopping for a solution to protect your systems. A battery backup serves as one of the easiest and most cost-effective methods of protecting against data loss. Further, quality battery backup devices help prevent damage to expensive computer equipment. Whether thunderstorms lurk, a facility’s electrical power proves inconsistent, or you just need to ensure your organization’s systems never shut down midstream, you’ll want to consider these 10 things when you look for a business-class battery backup. A common temptation when purchasing a battery backup is to buy the first low-end unit you find. When data retention and equipment protection are paramount, it’s critical that you opt for a battery backup and not just a surge protector. Surge protectors offer no opportunity to shut down systems properly when electrical service fails, nor do they typically offer the same level of equipment warranties found with battery backups. Manufacturers make all kinds of promises, including conditioned electricity delivery, and pack numerous outlets into even the least expensive units. If a battery backup doesn’t have the energy required to power the equipment you connect, the unit will perform poorly. It will generate additional heat, runtimes during power failures will be drastically reduced, and battery longevity will decrease. Make sure you don’t overwork the battery backup you select. Choose a model that can adequately meet your needs. Identifying the appropriate wattage is the first step. Most entry-level battery backups provide 200 to 450 watts and run between $40 and $100. Pay particular attention to wattage and volt-ampere ratings, as they not only impact how well a battery backup will operate, but they prove critical in knowing how much time you’ll receive to shut down systems cleanly when power outages occur. Unless you’re running only a single simple PC and monitor, elect for a more powerful device. APC, Belkin and Tripp Lite, three leading manufacturers of battery backups, each provide selection tools on their Web sites designed to help match your equipment’s power needs with an appropriate corresponding product. Organizations frequently experience service outages and are forced to replace equipment prematurely because a facility’s electrical supply is wired improperly. Even if the electrical service is properly configured upon deployment, there’s no guarantee it’ll stay that way. This is especially true with shared use office condominiums, strip-centers, and other locations where tenants change fairly frequently. Whenever changes are made to a facility’s electrical service, the potential exists for wiring circuits incorrectly, eliminating a ground or somehow otherwise introducing wiring faults. Insist on purchasing a battery backup that alerts you to any faults within the facility’s electrical supply. Otherwise, your best efforts to protect against data loss and fried systems could be for naught. With the schedules and responsibilities that today’s IT consultants and administrators assume, there’s typically no time available to run through a periodic checklist aimed at ensuring a battery backup—often a unit hidden behind a cubicle wall or tucked behind equipment in a server room—continues operating properly. When selecting a battery backup, confirm that the unit you’re purchasing includes software that not only regularly tests the device’s battery and runtime capacity but also logs the test data. There’s always a catch. Whether it’s buying tires (“Oh, and mounting costs an additional $19.95 per tire”) or a battery backup, you must read the fine print. In the case of battery backups, the number of electrical outlets the model possesses will be boldly declared within the product literature and likely the front of the box. But you need to read more closely to identify how many of those precious outlets actually provide battery protection. Some battery backups boast eight outlets, but fully half of them may be limited to providing battery backup service. Review a model closely before purchasing to ensure that you won’t be deploying a unit that fails to provide an adequate number of battery backup outlets. Voltage regulation is likely the single biggest issue with personal computers, servers, and ever-expanding widescreen displays. Sure, the local energy utility may do a good job delivering electricity without interruption, but the quality of the electrical service provided is almost always inconsistent. Over time, even minor fluctuations (notably brownouts and intermittent spikes) take a toll on sensitive computer equipment. When reviewing battery backup options, seek a model that offers automatic voltage regulation. In other words, purchase a unit that conditions utility-provided electricity before delivering it to the equipment you connect. This is a particularly critical consideration in environments where electrical lags, surges, and spikes occur frequently, such as industrial settings, factories, dentists offices (where high-powered medical equipment generates impressive spikes and sags several times a day), and similar locations. Battery backups work best when paired with software capable of closing open applications. Most UPS devices enable shutting down a system cleanly when electrical power fails, but special software is required to close open applications. Look for software (and the ability to configure a serial connection between the UPS and connected equipment) that supports closing open office productivity applications and other programs. In midsize and large enterprises, ensure battery backups support hot-swappable batteries before the devices are ordered and deployed. Battery life is but two years or so. If you maintain a few rows of server racks, having to power down equipment to replace UPS batteries quickly becomes a formidable, after-hours chore. Avoid late nights. Select battery backups that enable replacing their batteries without having to disconnect or power down attached equipment. Perhaps the most easily overlooked battery backup element is size. How big is the device you’re purchasing and where will you place it? Although those are seemingly two easy questions, a battery backup’s size often causes trouble. Wherever you place it (whether in a server rack, beneath a desk, or on a small riser), the power cords for the equipment you connect to the device must be able to reach it. Further, the unit must fit comfortably within its space; you must leave several inches of room on each side of a battery backup to enable heat dissipation. Mounting considerations are also a size-related issue. Several models boast floor stands and often 1U and 2U rack-mount hardware. Before purchasing, be sure to consider the battery backup’s size/mounting requirements. Network protection is critical. All the electrical protection in the world means nothing if you connect RJ-45 cables directly from telecom equipment to PCs, routers, switches, firewalls, and servers. Lightning strikes frequently travel telecommunications infrastructure and leave baked devastation in their wake. I’ve seen business-class DSL modems, firewalls, switches, NICs, and even motherboards all totaled by a single lightning strike. Be sure that the battery backup device you purchase offers RJ-11 and RJ-45 protection. By placing the battery backup—with its automatic voltage regulation and protection—between telecommunications equipment and your organization’s network and computers, you can most effectively prevent storm-related damage. Within most organizations, obtaining adequate battery backups will require significant capital expenditure. In other words, quality business-class battery backups are not cheap. An easily overlooked requirement, the units can cost even small data centers thousands of dollars to deploy. As battery backups protect an organization’s entire network, computer systems, and data from loss and destruction, it’s important to purchase from a reputable manufacturer. In addition, compare warranties carefully. Some models offer 90-day warranties, whereas better equipped business-class devices will feature two or three years coverage, not only for parts but for labor and batteries, as well. It may well make the most sense to pay up to 30 or even 40 percent more up front in exchange for assurance the manufacturer will step in should repairs be required two years after purchase and deployment. Article written by Erick Eckel, TechRepublic. To read the entire article, please click here.